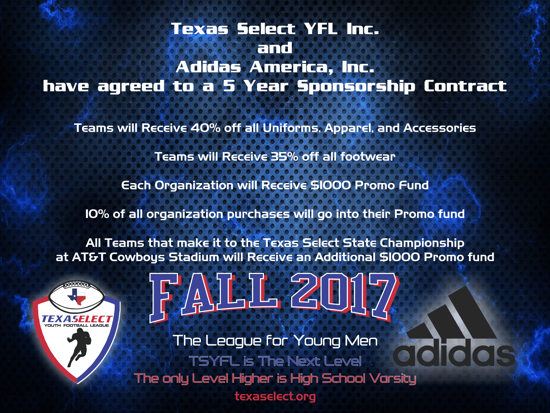 Texas Select Fall 2017 Season will begin September 2nd with opening games. All prospective new players, teams and organizations should begin the process to procure Tx State ID's, USA Football/NAYS certifications, Insurance, and background checks processed. All background checks must meet the TSYFL minimums for acceptance, and must be processed with Verity. All players must have current Physical. Currently Texas Select Fall 2017 will be offering Flag (age 4,5,6), 8U, 9U, 10U, 11U, 12U, 13U and 14U. The age cutoff for all age groups is July 31st 2017. 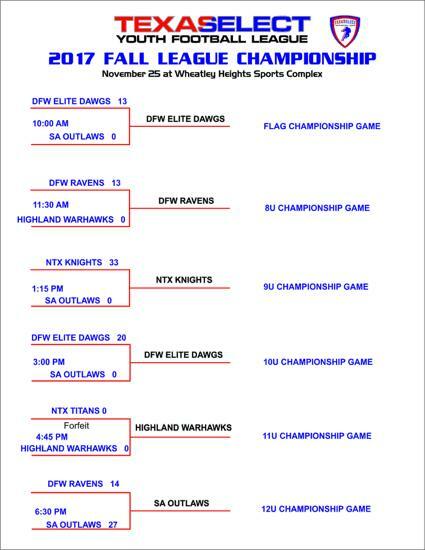 Texas Select YFL League Championship games will be in November at the AT&T Cowboys Stadium in Arlington, Texas. Click on the Conference in your respective area for more information.